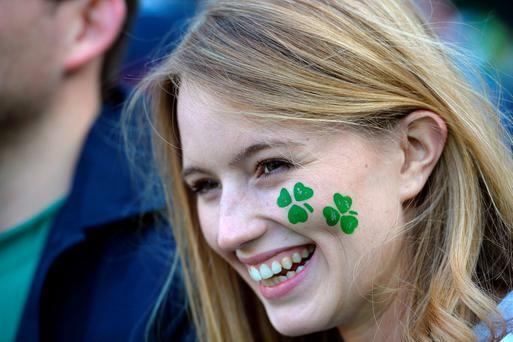 An Irish fan smiles before a Pool D match of the 2015 Rugby World Cup between Ireland and Italy at the Olympic Stadium, east London, on October 4, 2015. Georgia fans with face paint before the Rugby World Cup match at the Millennium Stadium, Cardiff. England fans before the World Cup match at Twickenham Stadium, London. Rugby fans react after watching the Pool A match of the 2015 Rugby World Cup between England and Australia at the official Fanzone at Twickenham stadium, south west London on October 3, 2015. England fans celebrates watching the game at the Fan zone at Deer Park in Richmond during the Rugby World Cup match at Twickenham Stadium, London. USA fans show their support in the stands before the World Cup match at the Olympic Stadium, London. A Canadian supporter shows their support ahead of the World Cup match at Leicester City Stadium, Leicester. PRESS ASSOCIATION Photo. Picture date: Tuesday October 6, 2015. A Canadian supporter shows their support ahead of the World Cup match at Leicester City Stadium, Leicester. A Romanian supporter shows their support ahead of the World Cup match at Leicester City Stadium, Leicester. Canadian supporter show their support ahead of the World Cup match at Leicester City Stadium, Leicester. England fans in the stands before the World Cup match at Twickenham Stadium, London. Irish fans pose before a Pool D match of the 2015 Rugby World Cup between Ireland and Italy at the Olympic Stadium, east London, on October 4, 2015. England fans react during a Pool A match of the 2015 Rugby World Cup between England and Australia at Twickenham stadium, south west London, on October 3, 2015. Rugby fans sit prior to a Pool A match of the 2015 Rugby World Cup between England and Australia at Twickenham stadium, south west London, on October 3, 2015. Rugby fans wave prior to a Pool C match of the 2015 Rugby World Cup between New Zealand and Georgia at the Millennium stadium in Cardiff, south Wales, on October 2, 2015. Rugby fans look on during a Pool C match of the 2015 Rugby World Cup between New Zealand and Georgia at the Millennium stadium in Cardiff, south Wales, on October 2, 2015. Argentina fans show their support in the stands before the Rugby World Cup match at the Kingsholm Stadium, Gloucester. PRESS ASSOCIATION Photo. Picture date: Friday September 25, 2015. Welsh fans before the Rugby World Cup match at the Millennium Stadium, Cardiff. A France fan shows his support during the Rugby World Cup match at Twickenham Stadium, London. An Ireland fan before the Rugby World Cup match at The Millennium Stadium, Cardiff. USA fans cheer on their team during the Rugby World Cup match at the Brighton Community Stadium, Brighton. A USA fan arrives for the Rugby World Cup match between Samoa and the USA at the Brighton Community Stadium, Brighton. England fans show their support outside the ground before the Rugby World Cup match at Twickenham Stadium, London. PRESS ASSOCIATION Photo. Picture date: Friday September 18, 2015. See PA story RUGBYU England. Photo credit should read: Steven Paston/PA Wire. A New Zealand fan wears facepaint in the stands during the Rugby World Cup match at Wembley Stadium, London. Tonga fans in the stands before the Rugby World Cup match at Kingsholm Stadium, Gloucester. Scotland and Japan fans before the Rugby World Cup match at the Kingsholm Stadium, Gloucester. Fans arrive for the Rugby World Cup match between Samoa and the USA at the Brighton Community Stadium, Brighton. A fan wears a zebra hat in the stands during the Rugby World Cup match at Wembley Stadium, London. New Zealand fans in the stands during the Rugby World Cup match at Wembley Stadium, London. Ireland fans before the Rugby World Cup match at The Millennium Stadium, Cardiff. France fans show their support during the Rugby World Cup match at Twickenham Stadium, London. England fans take a photo with a man in Fijian dress before the Rugby World Cup match at Twickenham Stadium, London. A New Zealand supporter reacts prior to a Pool D match of the 2015 Rugby World Cup between New Zealand and Namibia at the Olympic stadium, east London, on September 24, 2015. A Namibia fan shows her support outside the ground before the Rugby World Cup match at the Olympic Stadium, London. Australia fans cheer on their side before the Rugby World Cup match at the Millennium Stadium, Cardiff. A New Zealand supporter waves before a Pool D match of the 2015 Rugby World Cup between New Zealand and Namibia at the Olympic stadium, east London on September 24, 2015. Namibia fans in the stands during the Rugby World Cup match at the Olympic Stadium, London. New Zealand fans in the stands during the Rugby World Cup match at the Olympic Stadium, London. Australia fan cheers on his side in the stands before the Rugby World Cup match at the Millennium Stadium, Cardiff. Italy fans in the stands during the IRB Rugby World Cup match at the Otago Stadium, Dunedin, New Zealand. PRESS ASSOCIATION Photo. Picture date: Sunday October 2, 2011. See PA story RUGBYU Ireland. Photo credit should read: Lynne Cameron/PA Wire. RESTRICTIONS Use subject to restrictions. Editorial reporting purposes only; no images to be used to simulate a moving image. Commercial including Book use only with prior written approval. Call +44 (0) 1158 447447 or see www.pressassociation.com/images/restrictions. Ireland fans in the stands during the IRB Rugby World Cup match at the Otago Stadium, Dunedin, New Zealand. PRESS ASSOCIATION Photo. Picture date: Sunday October 2, 2011. See PA story RUGBYU Ireland. Photo credit should read: Lynne Cameron/PA Wire. RESTRICTIONS Use subject to restrictions. Editorial reporting purposes only; no images to be used to simulate a moving image. Commercial including Book use only with prior written approval. Call +44 (0) 1158 447447 or see www.pressassociation.com/images/restrictions. Ireland fans in the stands wearing fancy dress during the IRB Rugby World Cup match at the Otago Stadium, Dunedin, New Zealand. PRESS ASSOCIATION Photo. Picture date: Sunday October 2, 2011. See PA story RUGBYU Ireland. Photo credit should read: Lynne Cameron/PA Wire. RESTRICTIONS Use subject to restrictions. Editorial reporting purposes only; no images to be used to simulate a moving image. 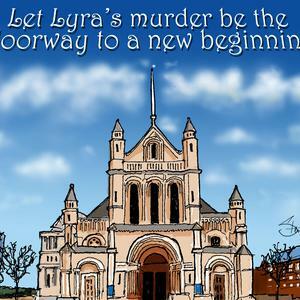 Commercial including Book use only with prior written approval. Call +44 (0) 1158 447447 or see www.pressassociation.com/images/restrictions. Russia fans show there support in the stands during the IRB Rugby World Cup match at the Rotorua International Stadium, Rotorua, New Zealand. : Ireland fans pose prior to the IRB 2011 Rugby World Cup Pool C match between Ireland and Russia at Rotorua International Stadium on September 25, 2011 in Rotorua, New Zealand. South African rugby fans react to the arrival of the Springbok team at Johannesburg's O. R. Tambo airport, Tuesday, Oct. 23, 2007. A sea of green and gold greeted South Africa's victorious rugby team on its return home Tuesday after winning the Rugby World Cup in France. South Africa beat England 15-6 in a convincing win in Paris on Saturday. Fans wave South African flags prior to the Rugby World Cup Group A match between South Africa and Samoa, Sunday, Sept. 9, 2007 at the Parc des Princes stadium in Paris. A Scotland fan plays a the bagpipes before the Rugby World Cup Group C match between Scotland and Portugal, Sunday Sept.9, 2007 at the Stade Geoffroy-Guichard in St Etienne, central France. Argentinian team captain Agustin Pichot, right, gets pictured by fans after the Rugby World Cup Group D match between France and Argentina, Friday, Sept.7, 2007 at the Stade de France stadium outside Paris. Argentina won 17-12. An England's fan reacts before the Rugby World Cup Group A match between England and Tonga at the Parc des Princes stadium in Paris, Friday Sept.28, 2007. A French rugby team supporter reacts before the Rugby World Cup Group D match between France and Georgia in Marseille, France, Sunday Sept. 30, 2007. Argentina's supporters react after Argentina defeated Ireland 30-15 in their Rugby World Cup Group D match at the Parc des Princes stadium in Paris, Sunday, Sept. 30, 2007. US rugby team supporters smile before the Rugby World Cup Group A match between South Africa and the United States in Mosson Stadium in Montpellier in southern France, Sunday, Sept. 30, 2007.